In this paper we propose a patch sampling strategy based on sequential Monte-Carlo methods for Whole Slide Image classification in the context of Multiple Instance Learning and show its capability to achieve high generalization performance on the differentiation between sun exposed and not sun exposed pieces of skin tissue. 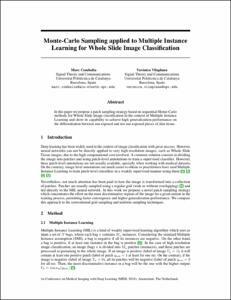 Combalia, M., Vilaplana, V. Monte-Carlo sampling applied to multiple instance learning for whole slide image classification. A: International conference on Medical Imaging with Deep Learning. "International conference on Medical Imaging with Deep Learning: Amsterdam, 4 - 6th July 2018". 2018, p. 1-3.